Wall lamp Luma from the Swedish Edblad is a stylish lamp made of clear recycled glass and matt brass. A special wall lamp with a casual look because of the hook that holds the wire. Wall lamp Luma is a stylish wall lamp. 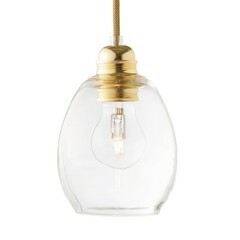 The matte brass gives it a retro chic look, the wall hook and the recycled, hand-blown glass make it more casual. The glass is produced at Bro Glassworks, located in Sätra Gård in Upplands-Bro, north of Stockholm and made with old TV and computer screens. The glass is mouth-blown, so small bubbles in the glass can occur and give the lamp its charm. Suitable for all light sources with E27 fitting (large fitting), for example the Vita Idea LED bulb. Max. 60 watts. Light source is not included.